Because of the angle between the sun, comet and spacecraft, we had a gibbous view of the comet, ie, we did not see the entire lit half. 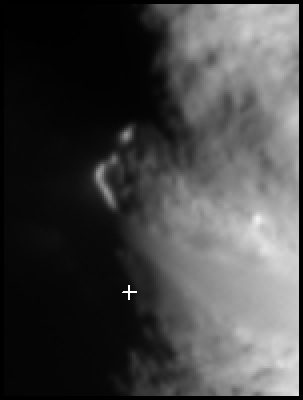 We saw most of it and a small portion of the dark side before the spacecraft passed the comet (left panel) and then as we looked back, we saw the dark side silhouetted. The middle and right panels show a portion along the terminator (yellow box) but with the contrast stretched in different ways. 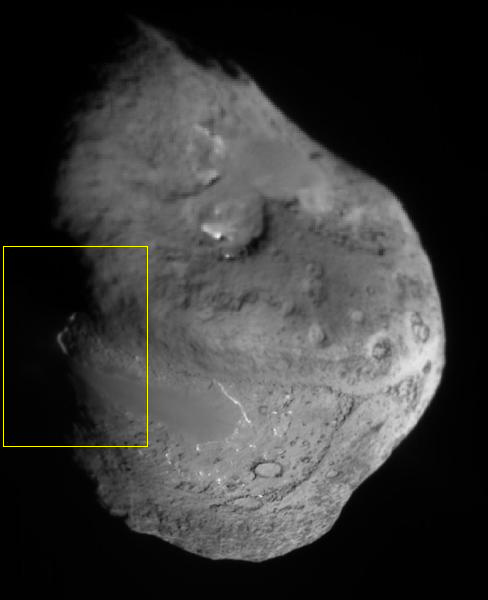 In the middle panel, the contrast is adjusted so that we can see the sunlit portion of the comet. The unlit portion appears dark. The right panel has the contrast stretched so that the sunlit portion appears overexposed (saturated) but now a fuzzy feature appears on the dark portion. 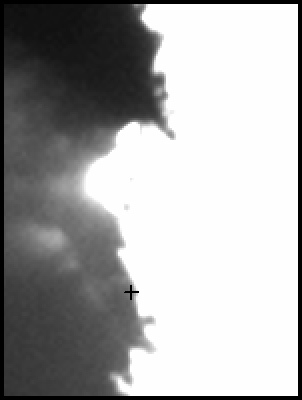 This fuzzy feature appears to be jet material that has risen high enough above the darkened surface to be in sunlight (in the same way that clouds seen on Earth can be brightly illuminated even though the sun is below the horizon). The cross in each panel marks the approximate location of the negative pole as determined from the shape model. The division above the cross is the morning terminator and below the cross the evening terminator (so from this perspective, the comet appears to be rotating clockwise).